Jozour is a company that is converting agricultural byproducts such as date palm midribs into wood to be used for furniture-making and other interior designs using an innovative technology developed by its founders. Jozour’s mission is to reduce pollution from the burning of these raw materials while also creating jobs and valuable end products for domestic and global markets. Jozour's mission | To convert agricultural waste products produced by the palm into beautiful, sustainable, and durable wood products to be sold in local and global markets. 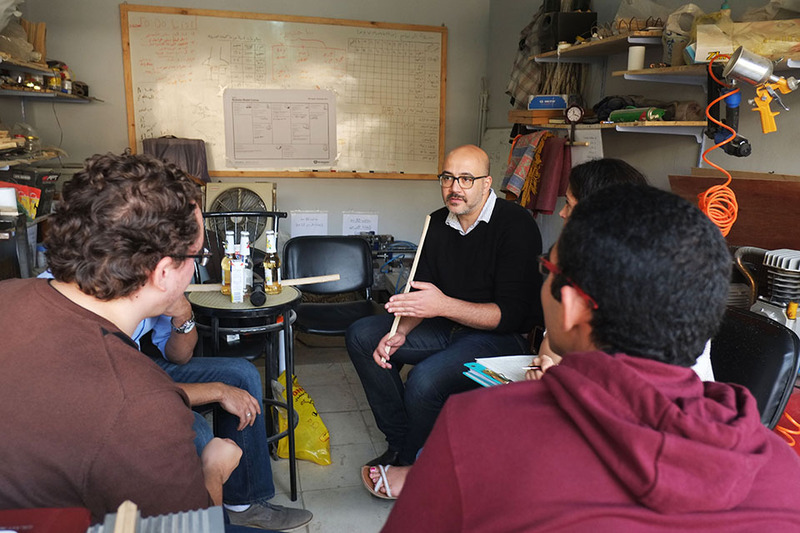 When a group of guys from Ain Shams University School of Engineering came together for their graduation project, they little predicted that they would continue their work together for years to come in a company they would co-found called Jozour. But 3 years ago, that’s exactly what happened. More than 400,000 tons of the agricultural waste product, palm midribs are burned annually in Egypt. Jozour is working to prevent this environmental hazard by collecting the midrib agricultural waste from farmers and, using their innovative machines, putting it to productive use as a manufactured sustainable wood product. Jozour hires in rural areas, reducing migration into the cities for low-wage day laborer jobs, which most often results in the expansion of the slums. Their model creates jobs all the way up the value chain, providing jobs from low-skilled work to high-end product design, manufacturing, sales and export. Jozour has increased its capacity to collect raw palm midrib material by 8x, increased its production capacity by 3x, and reduced production time by 70% over the past 2 years. 1. Provided a financial consultant to Jozour to assist in the company’s valuation, financial projections, and preparation for fundraising. 2. Attracted a top global designer in bamboo, to work with Jozour on identifying designs that are suitable for Jozour’s sustainable palm wood material. 3. Attracted a top sustainable wood/materials sciences expert to advise and work with Jozour on improving efficiency and quality of their production using palm. Together they tested and scientifically determined the structural composition of the palm midrib, and developed and identifyied the optimal product applications for the palm material. 4. Has directly contributed to an increase in process quality as well as manufacturing efficiency. "RISE has helped deliver technical assistance that we could not normally find in Egypt. I also feel I have a very supportive team who cares enough to sit and discuss work challenges and give constructive advice. I didn’t expect all the support we would get from the program, but now I believe we must help support each other to grow and be successful. " "I couldn’t ask for more from a program. RISE has been amazing and has addressed a variety of topics and issues that have enabled us to break through critical challenges. " "My experience with Jozour has just been phenomenal. "